Attacks with corrosive liquids, often referred to by the media as “Acid Attacks,” are becoming increasingly common. The attack may involve a corrosive liquid being thrown onto a victim, many times in the face. While incidents of corrosives attacks have occurred globally, Europe has seen the largest number to date. In 2016, London alone experienced 454 documented attacks with corrosive substances (both acids and bases). This is a drastic increase from the numbers seen in 2015 and 2014, 261 and 166 respectively. These types of attacks have not yet been seen widely in the United States, but there have been several events over the years; the most publicized in 2010 in Vancouver, Washington and Mesa, Arizona. 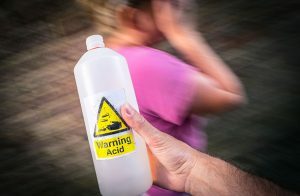 Americans are also, unfortunately, the target of acid attacks while traveling overseas as recently reported in September 2017 in Marseille, France. Agencies across the United States should be prepared for corrosive attacks and ensure a response plan is set in place. The following planning and response considerations are provided to assist agencies in preparing for corrosive attacks. Dispatch Centers and Public Safety Answering Points (PSAPs) should provide situational awareness training to their personnel regarding corrosive attacks. Rendering immediate emergency decontamination to the victim is critical, even prior to the arrival of first responders. PSAPs should evaluate whether their existing pre-arrival medical instructions are adequate to cover corrosive attacks such as providing pre-arrival phone medical instructions that can assist in performing emergency decontamination (decon) using available water sources. Responders who first arrive at a scene should always be aware that an incident may involve more than just corrosive materials and, as a result, consider the need for full personal protective equipment (PPE). At a minimum, responders should don gloves and eye protection and avoid contact with unknown substances while rendering aid, just as they would when handling a trauma call. Adele Bellis was the victim of an acid attack in 2014 while waiting at a bus stop in England. She received permanent scarring, lost her ear and half her hair when a man threw sulphuric acid at her on the orders of her abusive ex-boyfriend. Responders should implement their agency’s emergency decon procedures. Simultaneously, they should flush the victim’s contaminated skin with copious amounts of water, remove contaminated clothing, and attempt to position the patient so the water runs off the contaminated area (without pooling on the body) to minimize the spread of damage to a wider area. Do not attempt to neutralize the material on the patient’s skin. EMS agencies should provide situational awareness training on corrosive attacks, including reviewing their existing procedures for corrosive/chemical burns. Agencies should review their equipment and procedures for eye irrigation. If available, Morgan lenses may be used to irrigate the eyes with saline. If unavailable, a syringe assisted irrigation or simply continuously flowing a bag of saline across the eye may reduce eye damage. Many emergency medical protocols indicate that chemical burn patients should be transported to a burn center. EMS providers should review their existing transport protocols to confirm guidance for chemical burns in their response area and ensure they are familiar with their agency’s directives for transporting chemical burn patients. While many EMS agencies rely on fire suppression units to perform on-scene emergency victim decon, EMS agencies should consider their ability to provide limited immediate decon, especially to the face and eyes if arriving prior to a fire suppression unit. Law enforcement agencies should provide situational awareness training regarding corrosive attacks to their officers. Trained officers may be able to detect and prevent corrosive attacks assuming they are properly informed, educated, and aware of the signs. Tactical teams, crowd control units, and officers assigned to critical infrastructure/special events should consider having emergency decon capabilities on hand, such as Fibertect Wipes, and a water source, such as pressurized water extinguishers. When planning special events, agencies should consider restricting outside liquids from entering the event. If outside liquids are allowed into the venue or event area, consider limiting containers to only closed and sealed manufacturer bottles, and/or screening the liquids with multiple threat detection technologies. During event planning, identify locations in the area that can be used to support emergency decon such as facility showers, fountains, etc. It’s recommended that law enforcement agencies review their use of force policies to ensure they adequately address non-traditional weapons i.e., corrosive liquids. Hazmat teams may be called to the scene of a corrosive attack to identify the product, collect evidence, and/or neutralize remaining material. Hazardous materials’ response teams should provide situational awareness training to the members about corrosive attacks and review chemical/physical properties of common corrosives. Hazmat teams will likely arrive well after emergency decon is completed and the victim has been transported to the hospital. Corrosive liquids may be indistinguishable from decon water runoff as both may appear to be clear liquids on the ground. Hazmat Technicians should use pH paper to attempt to locate and identify corrosives. Acids will have a pH less than 7 and bases will have a pH greater than 7. If the container used to throw the material can be located, it may be used for field testing. Responders may be able to retrieve corrosive material from any portion of the victims clothing left on-scene. In all cases, all containers, clothing, and residual material should be treated as evidence and maintained for law enforcement use. If residual materials are available for testing, consider treating the material as a true unknown and screen/classify across all appropriate detection devices (i.e., radiation, ph, F paper, KI paper, LEL, PID, FID, etc.) before attempting to identify the material. When using identification technology, consider using multiple instruments such as FT-IR and Raman. If corrosivity is confirmed through pH, be aware that many mass spectrometer instrument manufacturers may not recommend inputting corrosive materials into the mass spectrometer. When using FT-IR and Raman to attempt field identification, results may vary. Sulfuric Acid and Nitric Acid can often be identified with Raman technologies, such as the Thermo Fisher FirstDefender RMX. In many cases, FT-IR technology indicates the presence of water in the corrosive solution. Hydrochloric Acid and Hydrofluoric Acid cannot be identified with Raman and FT-IR technology. Gary Sharp directs Federal Resources’ Hazmat/Fire Training divisions with years of expertise in various successful leadership roles. Prior to joining Federal Resources, Gary excelled as a Former Deputy Fire Chief, Manager of a Regional Fire/Police Hazmat team, Former Program Manager for the Michigan State Police Emergency Management & Homeland Security Training Center, and Former Hazmat Manager for M1-TF1 Urban Search and Rescue. Throughout the steady growth of HazmatIQ, Gary was the first paying customer after it was founded, and was then the first instructor as the program continued to expand. Gary is dedicated to teaching and training professionals to serve their communities by using long-term knowledge and industry expertise.